Ainsworth, the Aussie giant, an expert of creating amazing video slots has created Big Thunder Quad Shot. 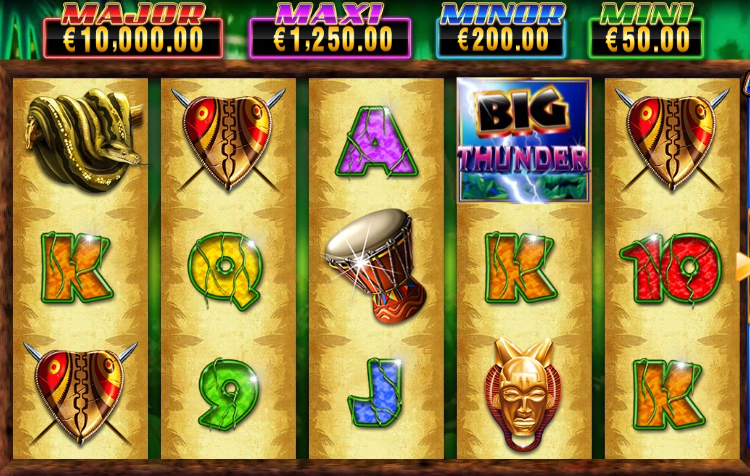 The game is a rainforest trivia which features a structure of 5 reels along with 25 paylines. In terms of story, the game tries to emulate the jungle life. It has its elements derived from a lush rainforest filled with rich flora fauna. The design of this game is nothing out of the ordinary; however, it does have some unique features. So, as players, you shouldn’t go expecting a plethora of striking graphics and features. But you should definitely foresee light-hearted gameplay with a chance of bringing good money home. The backdrop is definitely smooth and refreshing, so your eyes will be freshened up for sure. 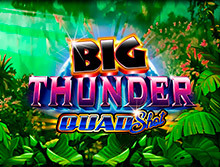 Big Thunder Quad Shot has a few bonus boosters that can avail you a hefty sum of payout. To be able to play this game the players can choose a wager plan from anywhere between £1.25 and £25 for every spin. If you luck out, you can expect multipliers like 3x or 5x. This game does have a jackpot, and the ways to trigger it can be understood in the following sections. This jackpot prize amounts to £10,000. If this isn’t handsome money, then we don’t know what is. Not only this, you can even avail this amount in case the multiplier gets involved in the base game. The maximum win of this game is a whopping sum of $250,000, while, the RTP or Return to Player rate of this game stands at 94.39%. This is not adequate in our opinion but given the multipliers, jackpots, and other shiny prizes, this shortcoming gets compensated. As already mentioned, Big Thunder Quad Shot has a very strong inspiration from a wild jungle. The symbols are all elements taken from jungle life. The symbols of this game are a mix of lower value as well as higher value symbols. For lower value symbols, you have your regular symbols of 10 to A. These are joined by a drum, tribal shield, totem mask, a bongo, and a snake. They are all covered by creepers. The main symbols of high value in this game are the gorilla and waterfall. If you land the waterfall symbols in pairs of 3, 4 or 5, anywhere on the reel then you can receive up to 12 times more than your existing wager. Landing the Gorilla symbol in certain pairs upon the reels makes for huge prize money. Wild: The wild symbol in the base game is the gorilla symbol. As we already told you that this symbol is important in the game. If the symbol pops up in the middle part of the reel then the wild gets activated. The symbol substitutes all symbols except the scatter symbol. This will, of course, help you avail a juicy payout. Scatter: Big Thunder Quad Shot also features an interesting scatter. The scatter in indicated by the Big Thunder logo symbol. If you land the logo of the game in pairs of 3, 4 or 5 then you will trigger the scatter. This will allow you to multiply your existing wins equal to 5 or even 100 times more. This will also lead to the Bonus reel feature of this game. Free Spins: The most sought after bonus in any game is that of a free spin bonus feature. In Big Thunder Quad Shot, the free spins are activated by the scatter symbol. As, when the scatter gets triggered (as shown above), you can expect 15 free spins in your kitty. The free spins can be multiplied by additional bonus symbols and 3x and 5x multiplier. All of this will highly improve your chances of attaining a big win. Jackpot: This Ainsworth creation features jackpots. You can win the chance of landing a plethora of jackpots ranging from 'mini', 'minor' to 'major' jackpot. To avail these benefits, hit a combination of 5 of the same type of symbols including the scatter symbol of this game. You can expect prizes ranging from £50 to £10,000. No matter the size of the jackpot, this feature definitely adds to the value of the game. This feature will be the reason why players will keep coming back to this game. Big Thunder Quad Shot is one of the classics of Ainsworth. The interface of the game is pretty functional and interesting. The simplicity of the game speaks to us really well. The touch of multipliers, bonuses, and jackpots makes for a plentiful slot game. We definitely enjoyed the game and the appeal of the slot impressed us.